One of the upsides of having a food review blog is that friends will often come up with items that they want to see me review. And one of the downsides of having a food review blog is that friends will often come up with items that they want to see me review. No, that's not a typo: that is the double-edged sword that is my life. Seriously! Sometimes my friends come up with stuff that makes me wonder if they are trying to turn me into their own personal Andrew Zimmern (even the ones who have no idea who Andrew Zimmern is). I believe they see some outrageous items and think to themselves, "Oho, there is just no way Gigi would ever turn down the chance to review a choice delicacy like dill pickle flavored, chocolate covered, durian stuffed Madagascar hissing cockroaches!" (OK, to be fair, I made that up...and if such a product exists, I am happy in my ignorance of it and ask only that it A: Not be brought to my attention, and B: That I not be offered samples.) My whole point is that sometimes I feel like people give me things based on an elementary school gross-out dare. My sister-from-another-mother, however, is an exception to that rule. Net and I are so physically similar that you could in fact mistake us for sisters -- well, first cousins at the very least -- and she always finds the greatest snack stuff for me to try. (She is completely to blame for my obsession with Herr's Puff'n Corn.) So when she said she had something new for me I was very excited. 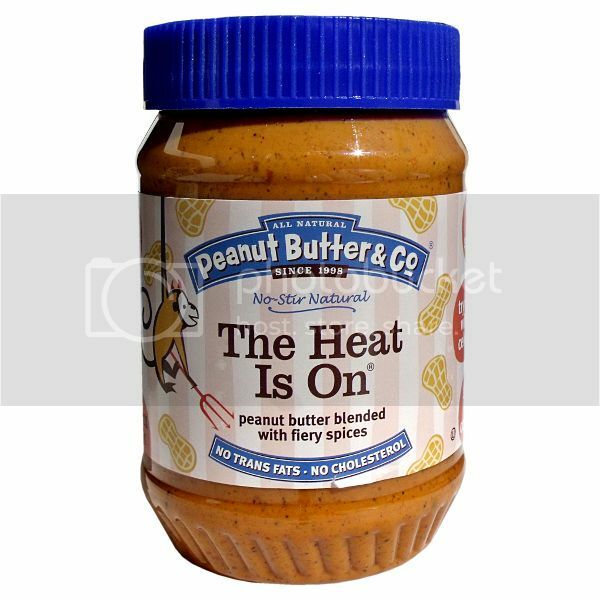 The Heat Is On, as you may have guessed, is a spicy peanut butter -- and lest you doubt that it's spicy, the monkey on the label is holding a little pitchfork. Monkeys would not lie to us. Even before opening the jar, you can tell that there is going to be a lot going on flavorwise, just by looking at the peanut butter. 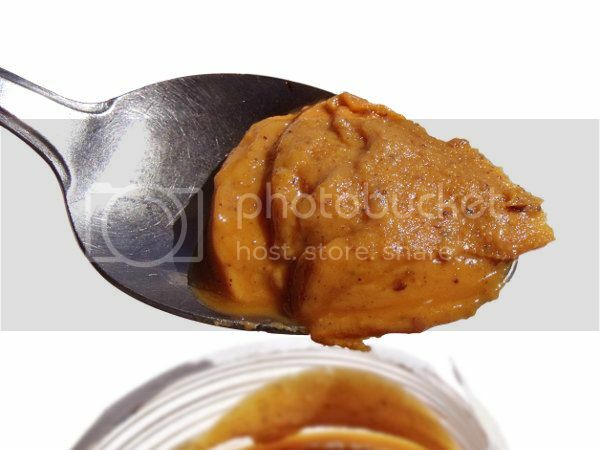 It's darker than your normal peanut butter; the color being more of a burnt orange than a tan. The butter is also studded with various dots and flecks of spices. When you open the jar the scent is that of strongly roasted peanuts. You can tell there's an extra something going on, but it's hard to pin down exactly what else it is that you're smelling besides the nuts. According to the label you don't have to stir the peanut butter, but I did notice some oily buildup on the top -- and I thought that the texture was a bit better for giving it a swirl. The texture is smooth but very thick, though not thick in the sticky manner of any of the mass market brands of choice. There is a slight graininess (though it is not chunky) that I think comes from a combination of the spices and the actual peanuts themselves. I really liked the texture. The taste -- forgetting the spices for just a second and concentrating on the base -- reminded me of super fresh, just-roasted peanuts. Slightly salty and completely missing the sweetness that my favorite mass market brand has. Now for the spices! It's going to be hard to go back to plain peanut butter after having spicy (and I may not, actually). The heat is just enough to give you a kick and warm your mouth up, but not enough to have people who aren't as big a fan of heat as I am searching for something to cool off with. On a scale of 1 to 10 in terms of heat for people who are not chiliheads, I would put it at about a 5 or 6 if you are really sensitive. The spicing is a mix of chili powder, cayenne pepper, crushed red pepper and paprika. (And while it's not listed on the label, I have to wonder if there's not a pinch of garlic in there as well.) To be really lazy, the easiest way I can describe the flavor is to tell you to imagine a peanut butter made with a bag of those "hot" flavored peanuts found at gas stations and mini marts. As someone who has been known to snarf those bags down embarrassingly fast, it stands to reason that I'd love a peanut butter version. What can I say? I just loved this peanut butter. I have been eating it straight from the jar, but I know it would make great sandwiches or sauces/dressings. Heck, I want to try to make cookies with it! No, I'm not kidding. It's really that damned good. Net: I would not whine! The dark chocolate and the maple both sound to die for! I am going to have to find things to send you in return! oh yesss this looks good! and i love the little devil monkey. Rod: I think it would be great in a satay sauce- I was thinking tofu or maybe even salmon. I know you (and the rest of the world) are about to think I am a big(ger) freak then you thought possible- I really don't like chicken. I will eat it here or there, mostly for a review. But otherwise I next to never have it. Tampa: I do love the monkey. They need to market the monkey!